Dr. Advincula is the Levine Family Professor of Women’s Health and Vice Chair, Department of Obstetrics & Gynecology, Columbia University Medical Center and Chief of Gynecology, Sloane Hospital for Women at New York-Presbyterian Hospital/Columbia University, New York, New York. He serves on the OBG Management Board of Editors. Dr. Advincula reports being a consultant to Blue Endo, CooperSurgical, Intuitive Surgical, and Titan Medical. Truong M, Advincula A. Minimally invasive tissue extraction made simple: the Extracorporeal C-Incision Tissue Extraction (ExCITE) technique. OBG Manag. 2014;26(11):56. The management of symptomatic uterine fibroids in the patient desiring conservative surgical therapy can be challenging at times. The advent of robot-assisted laparoscopy has provided surgeons with an enabling tool and patients with the option for a minimally invasive approach to myomectomy. 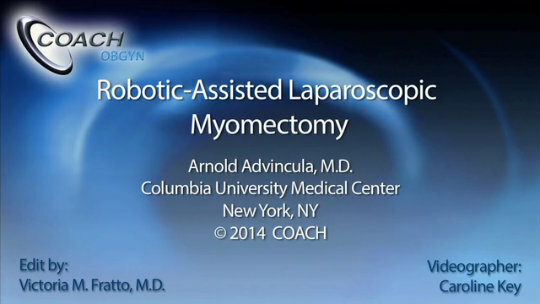 This month’s video was produced in order to demonstrate a systematic approach to the robot-assisted laparoscopic myomectomy in patients who are candidates. The example case is removal of a 5-cm, intrauterine posterior myoma in a 39-year-old woman (G3P1021) with heavy menstrual bleeding who desires future fertility. discussing robot-specific techniques that facilitate fibroid enucleation and hysterotomy repair. I hope that you find this month’s video helpful to your surgical practice.